For the first time ever, LEGOLAND Parks are offering a first look at an exciting new theme park attraction that reunites the stars of The LEGO Movie in an all-new story appearing exclusively at LEGOLAND theme parks and LEGOLAND Discovery Centers in 2016. The 30-second clip released last week gives fans the first glimpse of what happened after the blockbuster movie, when Emmet, Wyldstyle, Unikitty, MetalBeard and Benny reunite at the invitation of a shady new character, Risky Business, who plans to open a curious theme park bearing a suspicious resemblance to LEGOLAND. The LEGO Movie 4D A New Adventure will premiere Friday, Jan. 29, 2016 at LEGOLAND Florida Resort in Winter Haven, Fla., followed by LEGOLAND California Resort in Carlsbad, Calif., on Saturday, Feb. 6. The attraction will debut later at LEGOLAND theme parks and LEGOLAND Discovery Centers worldwide. This Christmas, Disney Parks celebrates not only the joy of the holiday season, but the unforgettable family moments it has helped guests create over the past sixty years. Disney Parks Unforgettable Christmas Celebration airs Friday, Dec. 25, 2015 (10:00 am.-12:00 p.m ET; airtimes vary; check local listings) on the ABC Television Network. Now in its 32nd year, the unforgettable Christmas special welcomes back Robin Roberts of ABC’s Good Morning America (GMA) as lead host. Reporting from the Walt Disney World Resort’s Magic Kingdom in Orlando, Florida, Roberts is accompanied by Jesse Palmer, who joins the event for the first time as a correspondent. New to the GMA team as a special contributor, Palmer shares key parade updates in the midst of the action on Main Street, U.S.A. Janel Parrish, star of the ABC Family hit show Pretty Little Liars – which will debut under the new network name, Freeform for its winter premiere on Jan. 12, 2016 – serves as music correspondent alongside Stitch from Cinderella Castle. Polar Bear Plunge at the San Diego Zoo was transformed into a winter wonderland early this Friday, as nearly 26 tons of glistening white snow blanketed the polar bear exhibit. 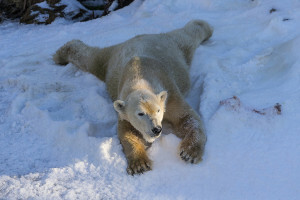 The three bears — Kalluk, Tatqiq and Chinook — showed their excitement by frolicking in the snow. They rolled around in the fresh powder and wrestled with each other all morning long. Animal care staff also scattered yams, carrots, melons and beef femur bones throughout the exhibit as added enrichment, and watched as the bears pounced and dug for their prizes. This surprise snowy enrichment was made possible by donors who contributed to the animal care wish list on the San Diego Zoo website, sandiegozoo.org. Enrichment is very important for the bears, as it stimulates them, keeps them active and promotes natural behaviors. As part of an ongoing partnership between Universal Orlando Resort and Orange County Public Schools, more than 200 students from local middle schools are visiting Universal Orlando this month for a hands-on look at real-world jobs that exist within the entertainment industry through a program called The Art of Tomorrow. Students from Carver, Union Park and Memorial Middle Schools are joining members of Universal Orlando’s Art & Design department to walk through the processes involved in creating the many attractions and shows at the theme parks. The students are touring soundstages where the creative team showcases several key processes, such as concept design, production, costuming and makeup – all centered around Universal Orlando’s Holidays and Mardi Gras celebrations. 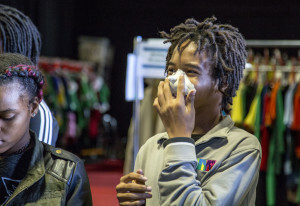 Students have the chance to fire confetti cannons, learn dance choreography, participate in graphic design projects, speak to performers from the popular Grinchmas show and more. 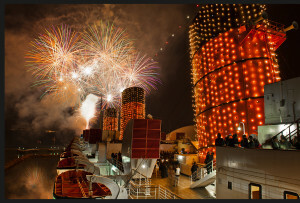 Leave your passport at home; this New Year’s Eve around-the-world-party only requires a ticket to the Queen Mary. Regally berthed in Long Beach harbor since 1967 she will again host an epic night of entertainment festivities and culinary adventures inspired by international destinations; five hours of dining, dancing and toasting aboard three acres of floating maritime history, as New Orleans, Moscow, Beijing, Tokyo and Hollywood celebrate 2016 as only the Queen Mary can. The Promenade Deck will evoke Bourbon Street at Mardi Gras, vibrating with the sounds of New Orleans Jazz spiced by Cajun cuisine and Hurricanes, the city’s famous rum-filled concoction raised high in the hands of bead-wearing revelers. Trade the Hurricane toasts for Moscow Mules in the Royal Salon, transformed to Red Square and a Russian celebration with DJ Mickey O spinning Hip Hop backed by dazzling aerialists. Good fortune and Chinese traditions await those on the Sports Deck where dragon dancers, lion dancers and a Kung Fu show will welcome the New Year, Beijing-style. Tokyo-bound guests will liberate their inner dancer on the Queen’s Verandah Deck turned ‘Tokyo at Night’ featuring a Hip Hop Dance Show and DJ Barbie’s Top 40 hits. Sushi, sakitinis and karaoke complete the Japanese adventure.